One quick glance at the all-new Jeep Cherokee sport utility vehicle will tell you that even though its name may be identical to the car carrying the same name in the 1990s; this is NOT your parent’s Jeep Cherokee. With steely, cat-like running lights, a gap-tooth grille and two-tone engine cover, the 2014 Jeep Cherokee has returned from the grave and is ready to pounce on whatever challenge comes its way. Whether it is off-road trails, rock-studded stream beds or steep embankments, the Cherokee is ready, willing and totally capable of handling all encounters with the ease and grace that one would expect from a true four-wheel-drive. It’s a Jeep, after all. But let’s face it, for most of us, the closest that we will ever get to going off-road is a trip down a dusty lane to the farmer’s field for some hand-picked produce. Or maybe it will be a post-snowstorm trek to the local market before the city plows have cleared the suburban streets of slush and snow. In fact, it’s on dry roadways and freeways where the new Cherokee distances itself from its predecessor. While the old version handled well enough in rough terrain, it failed on flat streets because it rode like a truck, with all the rattles, bangs and bounces that go with a boxy workhorse design. Today’s Jeep Cherokee rides more like a fine-tuned sedan than an SUV, sporting world-class on-road dynamics and a top-rated fuel economy of up to 31 mpg. You read that correctly, a Jeep that is so technically advanced that it rivals much smaller sedans in fuel efficiency. The Cherokee is the first-ever SUV to feature a nine-speed automatic transmission mated to a choice of two engines. The 2.4-liter Tigershark I-4 engine (standard) delivers an EPA rating of 22 city/31 highway and 25 mpg combine in 4X2 models, a 45 percent improvement over the previous model. For a more powerful ride, a 3.2-liter Pentastar V-6 engine is available, producing 271 horsepower and had a tow capacity of 4,500 pounds. 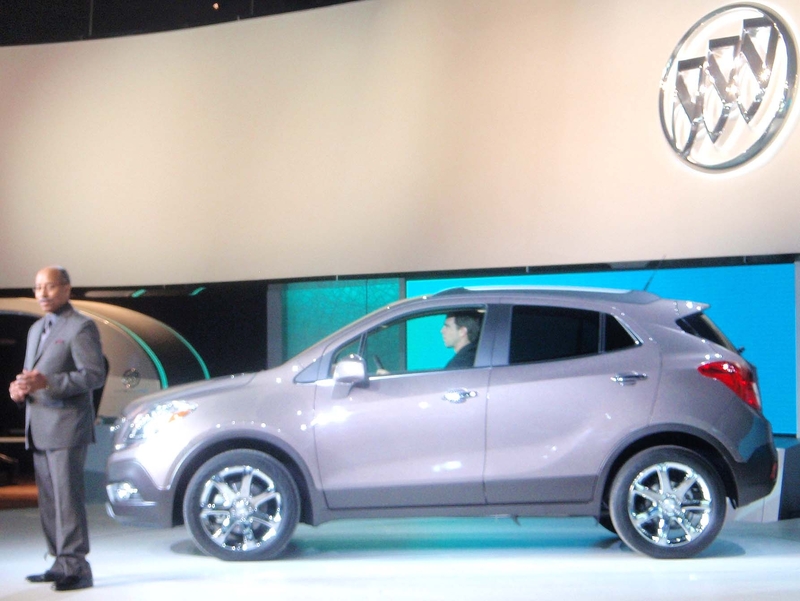 In two-wheel drive models, fuel economy for the V-6 is 19 city/28 highway/22 combined. Of course, most Jeep buyers will want four-wheel-drive capability because that’s where the Cherokee excels. 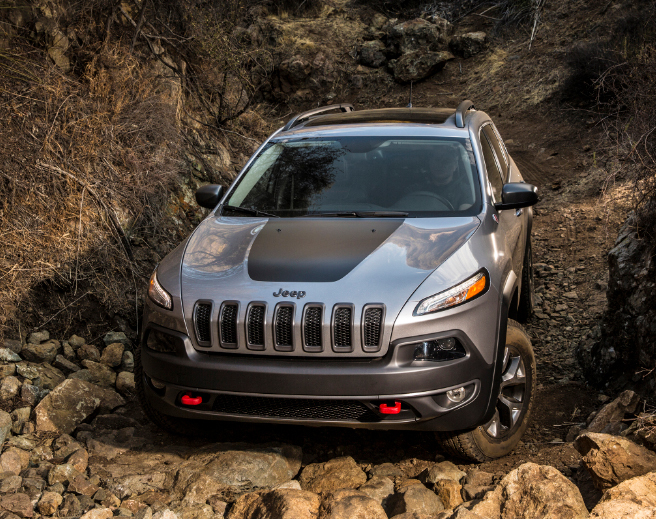 With three systems available, the Cherokee is sure to satisfy the desires of the off-road crowd. 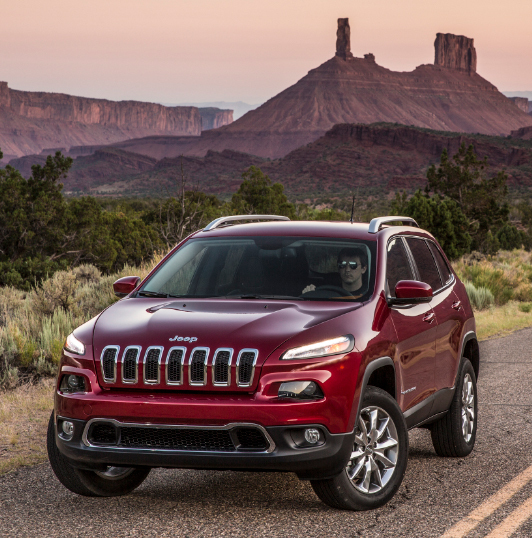 There’s the Jeep Active Drive I, which features a one-speed power transfer unit (PTU); Active Drive II with two-speed PTU and low range function; and the Active Drive Lock, available on the Cherokee Trailhawk models, with two-speed PTU, low range and locking rear differential. All 4×4 systems feature the Jeep brand’s renowned Selec-Terrain traction control system, which allows the driver to choose the on- and off-road setting for optimum performance. Up to five customized settings are offered: Auto, Snow, Sport, Sand/Mud and Rock. 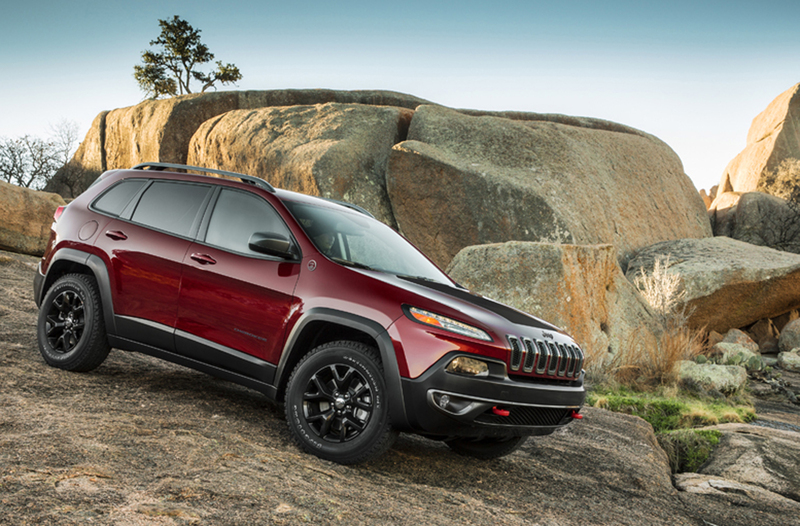 Sporting a distinctive and stylish “Trailhawk badge,” the new Cherokee includes, as standard equipment, aggressive approach and departure angles, complements of the unique front and rear fascias, one-inch factory lift, Jeep Active Drive Lock with locking rear differential, skid plates and signature red tow hooks. The locking rear differential is selectable in any low range terrain mode, but will lock automatically when in certain modes, such as “Rock,” to maximize effort to the tire that can support it. 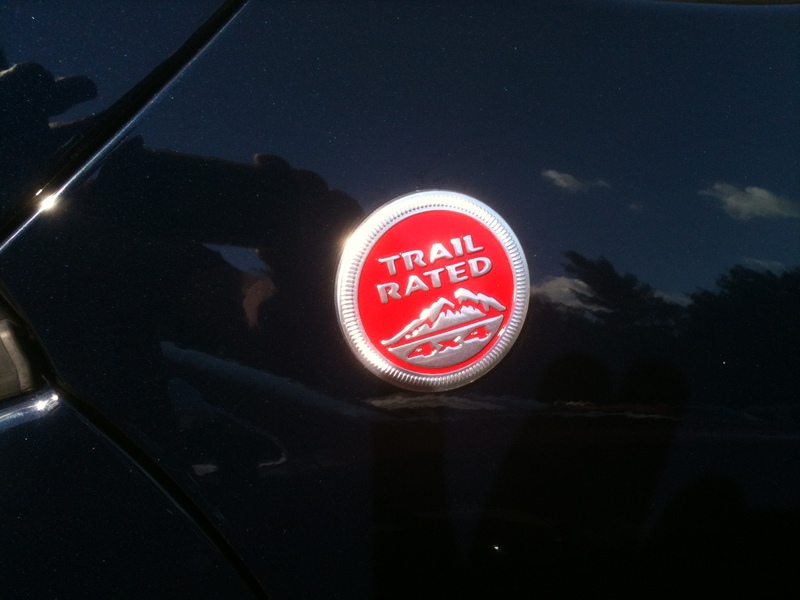 According to Chrysler, the “Trail Rated” badge on the Jeep Cherokee Trailhawk indicates that the vehicle is designed to perform in a variety of challenging off-road conditions identified by five key consumer-oriented performance categories: traction, ground clearance, maneuverability, articulation and water fording. The interior appointments of the new Cherokee are similar to those luxury amenities previously found only in the Grand Cherokee. The trim is soft to the touch and seats are comfortable and ergonomically designed and trimmed with available Nappa leather. The second row seats split 60/40 and are adjustable to provide better comfort for tall passengers, or extra space for cargo. Also available is a heated, leather-wrapped steering wheel, ventilated front seats, wireless charging pad, 8.4-inch touch screen multimedia command center, and Uconnect system that allows the driver to control the audio, climate, heated/ventilated seats and much more from the screen or with voice commands. 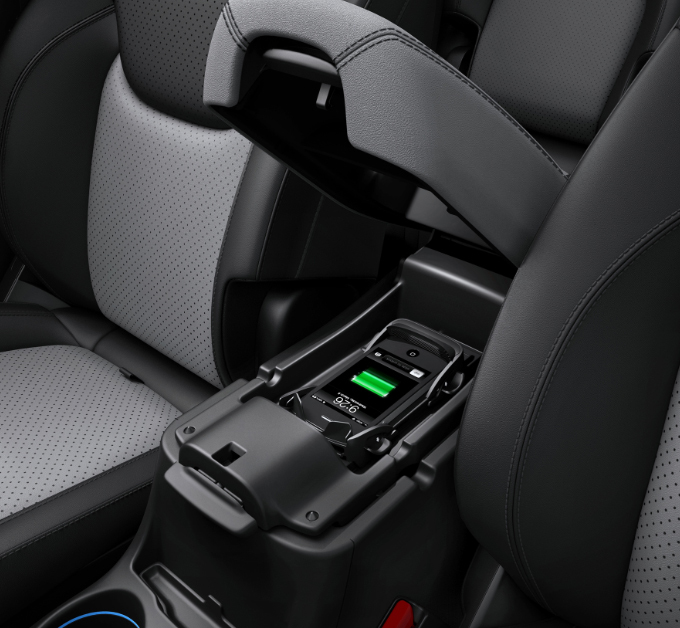 Active and passive safety features abound in the new Cherokee, including a special parking system called “ParkSense” that uses ultrasonic sensors to find and guide the vehicle into an available parking space. Other features include adaptive cruise control, forward collision warning, and lane departure warning; 9-1-1 assist call; electronic stability control; electronic roll mitigation; blind-spot monitoring; rear cross path detection; rear backup camera and 10 standard air bags. 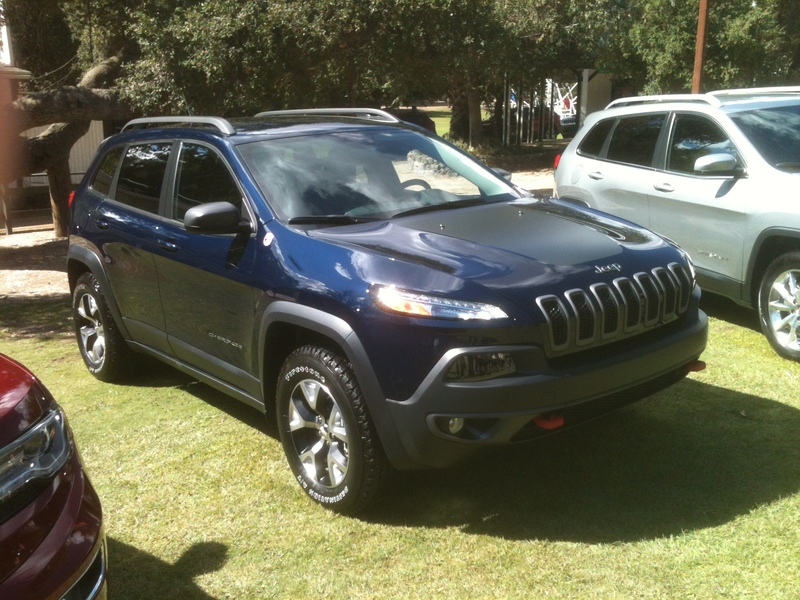 • Jeep Cherokee Trailhawk 4×4: $29,495. 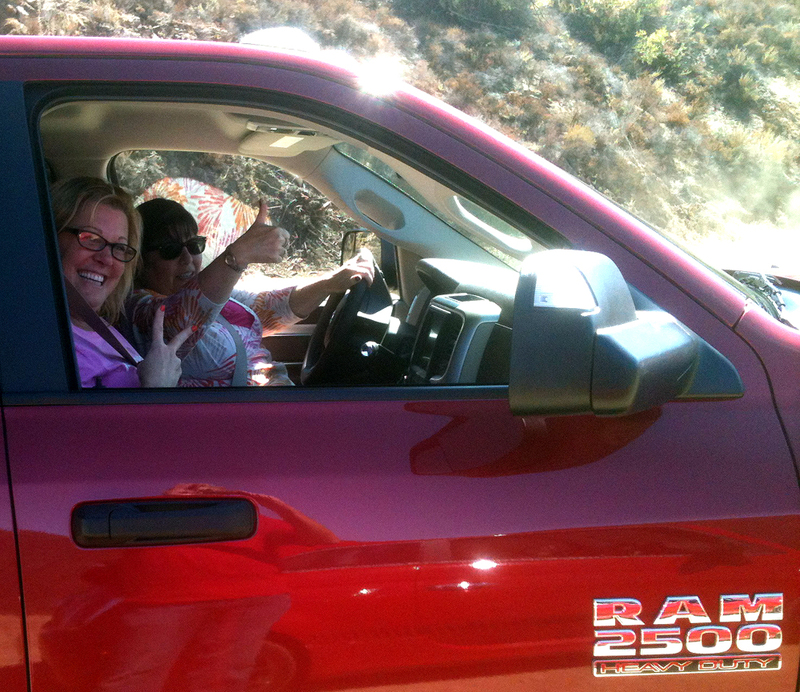 Special thanks to our expert off-road drivers, Christina Selter and BJ Kileen of HerHighway.com.